The book uncovers the truth behind Michael’s kidnap by armed terrorists, his family setting up their own island nation, government sieges, top secret government documents and multiple attempts to bring an end to the Sealand dream. The book includes previously unseen photos from his family’s personal collection. 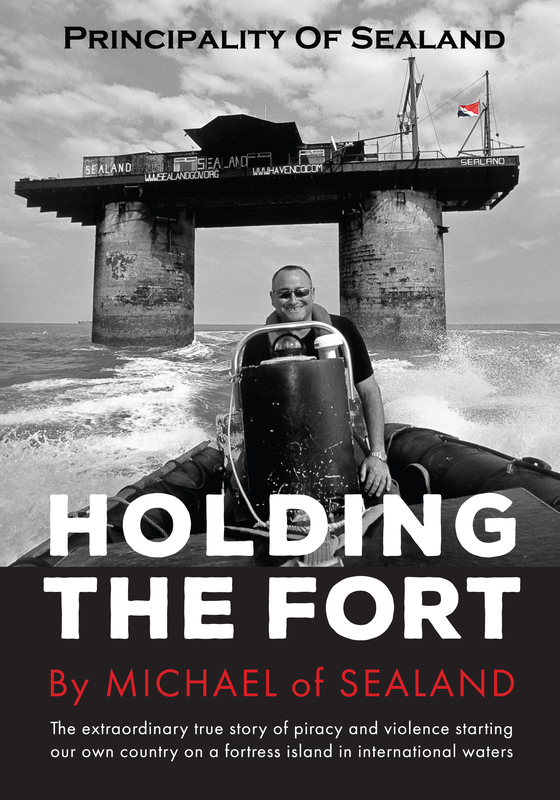 The true story of his unbelievable adventures over the last 50 years on Sealand. “When a story features sawn-off shotguns, dawn helicopter raids, pistol whippings, temperamental generators, shady tax accountants, devious gangsters and at least one flying headbutt to the bridge of the nose, ‘romantic’ probably isn’t the word that springs instantly to mind. Especially when at the heart of that story is an outwardly charmless, forbidding structure way out in the cold and dark of the North Sea.Yet the story of the Principality of Sealand is a patently romantic one. It’s a classic case of the underdog kicking against authority and winning; a heartwarming narrative of battling the odds that’s grounded in good old- fashioned British eccentricity. It’s a riproaring yarn, a classic Boy’s Own tale related here by the boy himself, Michael of Sealand, with verve, wit and panache. But look beneath the surface, beyond the guns and dastardly plots, and you learn from these pages that Sealand is also a story of family; of loyalty, respect and devotion flowing between generations and filtered through this tiny principality off the Essex coast; channeled through the dreams, hopes and stubborn stand against seemingly impossible odds of the Bates family.The story of Sealand is like an Ealing comedy crossed with a Bond film and scripted by John Le Carré. It’s a story that has often been swathed in myth and blighted by rumour, but here, at last, is the definitive tale from the man best qualified to tell it. And he tells it very well indeed.” – Charlie Connelly. Charlie is a bestselling writer and award-winning broadcaster. His books include Attention all shipping. Become a Noble Knight, Lord, Lady, Baron or Baroness of the smallest country in the world! © Copyright 2012 - 2015 Principality of Sealand. All rights reserved.